History of the island of Naxos, Cyclades, Greece. Art, Lygdamis, Palatia, Portara, Sphinx, Sanudo, Castle - Naxos island, Cyclades - Greece. Tourist and Business Guide of Naxos. Beaches, hotels in naxos, studios, naxos rooms, apartments, history of naxos island, villages, windsurfing, shops, travel. Naxos island, Naxos hotels, Naxos rooms, sports, cinema, holidays, photos, maps, accomodation, camping, online bookings. Photo gallery, Hotels, beaches, Mikri Vigla beach, Agios Prokopios, Agia Anna, Plaka, Apollonas, Filoti, Apiranthos, Chora Naxos. Ferries to Naxos, cheap flights, rent a car, car rentals, nightclub, guestbook, greek recipies, greek language. Naxos is the biggest island of a complex of islands called Cyclades (seen here on the right). There are various stories about the origin of the island's name. 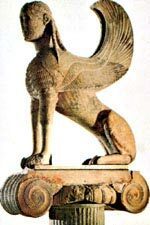 According to the one it comes from Naxos, Endymion’s son, who was the leader of the Carean settlers. According to another story it comes from the word “naxae”, the generous sacrifices offered to the gods. During the Venetian occupation the island was called Naxia or Axia, variations of her ancient and present name. Naxos is known in mythology as the island where Theseus abandoned Ariadne, after slaying the Minotaur - and as the island where Ariadne met Dionysus, god of wine and protector of Naxos. The story has two versions of what happened next. One story tells us that Ariadne fell in love with Dionysus, while another version tells us that Ariadne was devastated - and to avoid the lustful advances of Dionysus, threw herself off the cliffs of Palatia (Hill on which a Temple of God Apollo was built. This is also known by the locals as 'Portara') into the sea. It is also said that God Zeus himself also visited the island, and the highest mountain of the island took his name. That is said to be the relation between the Greek God and the mountain "Zeus" on Naxos. The island of Naxos has a very long history of over 5000 years. The Cycladic civilisation for instance dates back to 3000 BC. During 1600BC-1200BC Naxos was influenced by the Mycenaean civilisation (Crete). That influence is still evident in part of the island. 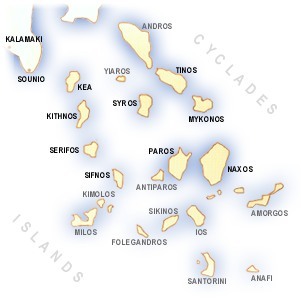 By 700BC Naxos had started developing sea trading, and also started to create colonies. This can be seen on the island of Delos, where most of the statues and temples built there were built with marble from Naxos. Later on 523 BC the Tyrant Lygdamis took over the leadership of the island and 33 years later the island was devastated by the Persians. The island was occupied by the Romans between 338 BC and 326 AD and was part of the Byzantine Empire between 362 - 1204 AD. In 1204 Marco Sanudo took over Naxos and organised most of the archipelago into a Duchy of Naxos with himself, naturally, as the first Duke. He built a powerful castle in Naxos Town (Venetian Castle) which was consisting of 7 towers. Only two of the original seven towers (those of Sanudo and Glezos families) remain. The castle today includes a housing complex with the structure of a medieval city, one of the very few preserved in Greece. Venetians, Catholic descendants, still live in the old mansions which encircle the site. He and his successors, although ruling with a heavy hand, continued in power until the Turkish take-over in 1566, when the infamous Barbarossa conquered and plundered the island. Turkish rule was briefly interrupted by the Russians in 1770-1774 and was finally ended by 1821 war of Independence in which the people of Naxos played a important part. In 1828 the island was finally united with the rest of Greece. During this and last century Naxos has supplied Greece with many worthy men and women in the fields of politics, literature and art, medicine science www.nikehuarache.nl and sport, and has always been at the forefront in all Greece's struggles for independence, freedom and peace. Even in these days, the island's authorities pay tribute to those who fought for the freedom and peace of the island. Statues in Chora Naxos and other villages on the island is a living tribute of the struggles of the people of Naxos through history.